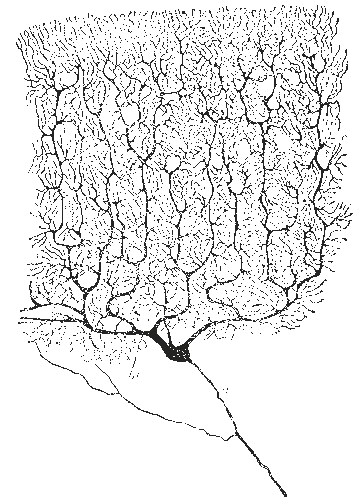 Drawing of a Purkinje cell in a cat’s cerebellar cortex by Santiago Ramón y Cajal. Biological neurons inspired artificial neural networks, the basis of deep learning. in the 1950s, but the similarities are only superficial. Imagine you own a dating website and you have profile texts from all your users. You would like to identify the age and interests of your users from their profile texts so you can make recommendations. Until recently if you wanted to do simple tasks such as identify the age, gender or demographic type of a user from this text, or recommend one profile to another, you would have had to hire somebody to spend months painstakingly engineering a set of rules to parse the text. Of course this doesn’t scale and you end up with a mess of rules that nobody understands and which are hard to maintain. Unfortunately what I have described is the reality in many companies that have encountered this kind of problem, simply because no alternative was known at the time. In recent years huge advances have been made in deep learning. This is a sub-field of machine learning that allows us to produce computer programs that can analyse complex data such as text, images, sound or video with relatively little human instruction. This has many exciting applications in business and in most industries, companies have not yet started to tap the potential of deep learning.